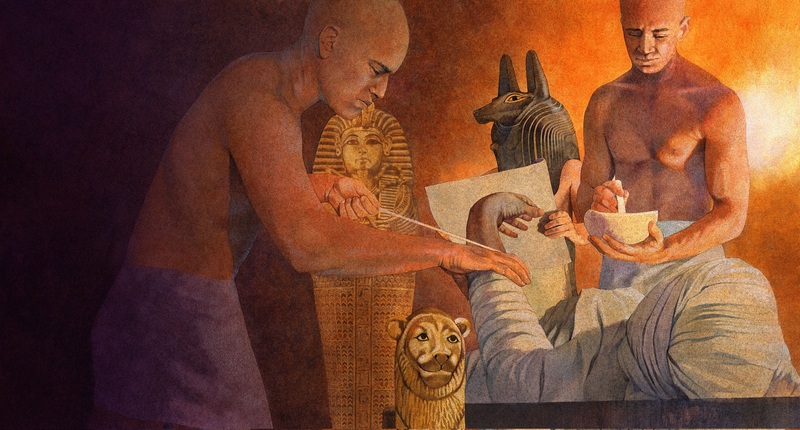 Have students try these activities to expand their knowledge and interest in Mummies. Who were Vladimir Lenin, Joseph Stalin, Ho Chi Minh, and Eva Peron? Why were their bodies placed on display? Have pairs of students do research on one of the individuals and write a report summarizing their findings about the individual. They should include information about where and when the individual lived and what he or she accomplished. Have students listen to a golden oldie. In the 1970s, artifacts from King Tut’s tomb were on tour in museums throughout the United States. Steve Martin, a well-known comedian, performed a song spoofing King Tut. Students may enjoy listening to a recording of the silly lyrics. Students can demonstrate the drying effects of salt. Have students place a piece of bread in a plastic sandwich bag, leaving the bag unsealed. In another bag, have students place a piece of bread, completely cover the bread in salt, and leave the bag unsealed. After several days, students should put on rubber gloves and remove the bread from the bags. Have them compare the pieces of bread, noting whether one piece is dryer than the other, whether mold grew on them, and so on. Make sure students dispose of the bread and bags. Ancient mummies were buried with artifacts that they could use in the afterlife. Ask students to write a list of items a modern-day mummy might want for the afterlife. Students might set up an exhibit of items or draw or photograph items to accompany their list. Encourage students to explain why they would include each item on their list. Have students become archaeologists and dig into the past. Ask them to find out who Juanita of Ampato was and what archaeologists learned from her. Provide clues to Juanita’s identity by telling students that she was an Incan girl. You might recommend these books: Frozen Girl by David Getz and Discovering the Inca Ice Maiden by Johan Reinhard. Have students design the inside and outside of a mummiform. They might mold a coffin from clay or make one with papier-mâché. They can use paints or markers to draw pictures or write words on the mummiform. P.S. Have interested students read Kids Discover Pyramids and Incas for more information about the ancient Egyptian and Inca mummies!